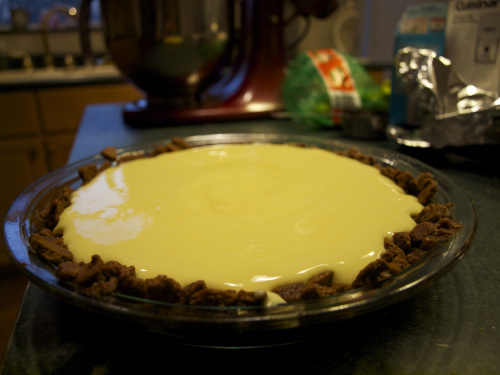 Traditionally thought of as a summer dessert, in my opinion key lime pie can be served at any time of the year. In order to make the pie a little more appropriate for the temperature though (despite an unusually warm December in St. Louis), I put the filling in a gingerbread crust. Filed under Pics or it Didn't Happen, pie, Yale, Zach B. 1. Preheat oven to 350 F. Butter and flour a 9×13-inch baking dish. 2. In a bowl, sift together the flour, baking powder and salt. In a separate bowl, beat the butter, chèvre and sugar on medium speed for 5 minutes. 3. Add the melted chocolate and beat to incorporate. Scrape down the sides of the bowl and beat in the whole egg and the egg yolks one at a time. Add the vanilla and mix to incorporate. 4. Using a rubber spatula, fold in the flour mixture. Pour into the dish and bake for 25 minutes. Allow brownies to cool to room temperature before cutting. A ten minute writing exercise for a class I’m taking this semester, Ordinary Romanticism. The prompt: describe your ordinary. The ordinary is the space in between steps, breaths, heartbeats—the inexplicable pause in flight as one hamstring stretches back, drawing bands of tendon across kneecap and retracting the foot in one long arc, the other thrusting forward, a transformation of flesh into energy, body translated across space. Running (every morning) begins in the gray fog of the Hudson, where I can barely detect outlines of old docks and a crane poised to rip rotting timber from the water. I live in Morningside Heights, close to Riverside Park and a few jogging paths, so I step outside and start running immediately, allowing the urban and the real to recede in my peripheral vision. When I am running, by the river, in January, my imagination flickers like a projector running scratched film. For an instant, I run along the Charles, another, a beach in South Carolina or Greece, or sometimes I return to the Cumberland—last summer, I injured my knee and could not run, only walk, past the Country Music Hall of Fame to the Cumberland Greenway. I enjoy revisiting that site of defeat and running past my tired and hurting, ancient, memorialized self. If ordinary is defined in its negative term, that which is not extraordinary, then running is a paradox. It simultaneously celebrates an expression of the body extraordinary and frees the mind to fixate on nothingness. In The Temple of the Golden Pavilion, Mishima describes the world as beautiful only in its reflexive state: as illuminated on a pond, in the moonlight, or reflective of the titular structure itself. Similarly, running and the ordinary are beautiful and coterminous because they capture the permanence of impermanence: the space in between the spokes, where the usefulness of the wheel can be found. And it is in the space between strides that the body and mind are, spiritually, in a state of ordinary perfection. Four months ago I sat in my first lecture of college listening to a man proudly sporting a necktie covered with images of corn. ”It always comes down to food,” he said, pointing to a portrait of a family gathered around a dinner table. Blog at WordPress.com. The Pilcrow Theme.